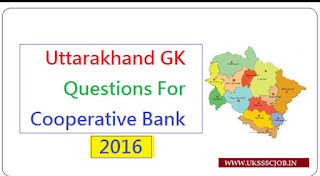 Uttarakhand GK PDF Question And Answer For Cooperative Bank PO Exam. General knowledge is one of the important section to crack competitive exams. Here we lot of free gk study material which you can learn. Complete study material of GK Free oneliner Current Affairs and GK Quiz. Objective type gk questions with answers.